While sorting out some books in preparation for a house move, I came across a 'Merseyside Guide To Real Ale', published in 1985, a booklet I'd completely forgotten about. It cost 50p (£1.53 now, so it was quite a bargain) and is a fairly slim volume which could easily slip into a coat pocket. As was usual in those days, the pub descriptions were rather sketchy, but I think it's safe to assume, in an age when beer choices rarely changed in pubs, that the beer situation was accurately described. This was published four years before the Beer Orders which turned the pub world in its head. Looking at Southport, where I lived then as now, there were 25 pubs, bars, clubs and hotels listed as serving real ale. There were quite a few more non-real ale pubs, of course. In contrast, off the top of my head I have counted 41 outlets that currently serve real ale in the same area, and there may be one or two others that have slipped my mind. Most of the beers sold in pubs were from the brewery that owned them and, as the chart shows, most pubs had only one or two real ales on. Nowhere had more than four real ales, and only one real cider was listed (Bulmers Traditional). In contrast, serving four or more real ales is quite commonplace in the town nowadays, with a few venues hitting the eight to eleven range. 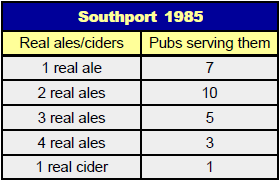 Real cider is still fairly uncommon in Southport, but at least we can do better than just one. All the rest were standard house beers from Allied Breweries, Bass, Burtonwood, Whitbread, and Matthew Brown/Theakstons. I know there was a couple of Greenall Whitley houses but I presume none sold real ale. As variety goes, this all looks fairly tame today, even the comparatively 'unusual' choices, although it's worth noting that in 1985, Pedigree, County and Boddingtons were much more highly rated than they are now. It strikes me that, in all the doom and gloom over pub closures - and some venues listed in this guide have since been lost - we may forget that overall the situation is a lot healthier in terms of choices of beers and places to drink them than ever before, largely due to the numbers of micro-breweries and the rise of micropubs and other bars serving real ale. I am not blasé about losing traditional pubs, and I know that some people consider the market is over-saturated with breweries and micropubs that may not survive in the long term, but despite all that, I can simply say that I much prefer to drink in today's Southport than that of 1985. I bet there was a damn sight more real ale drunk in 1985 than there is now, though. No doubt about that, but I wonder whether one reason, among many, for the decline since 1985 is because most beers in those days were - let's be honest - quite boring?